With the job market saturated with highly qualified candidates who have been laid off from jobs they’ve held for years, it’s no secret that many are now interested in applying for jobs that may fall below their level of expertise. If you are a candidate who may be overqualified for a job you’re considering, think about making adjustments to your resume to help you get the job. Subtract “too impressive” job history and education. Believe it or not, it’s perfectly acceptable to leave information off of your resume that might be considered too impressive. For instance, if you have worked as a marketing executive but now want to apply for a job as a human resources manager, you can leave the executive information off, especially since the new and old positions aren’t in the same field. Same goes for education. If you have a doctorate, you don’t have to add it to your resume. You can postpone any discussion about this qualification for your interview where you can take the time to explain why you’re looking for a job that doesn’t require as much of a challenge. Add extra details about history that help you qualify. On the other hand, it’s a great idea to elaborate on various aspects of your career that can help you better qualify for a position. Take time to think about what made you a great manager at a previous point in your career. What caused you to excel and advance to the level you reached prior to leaving your last job? As a manager, you’re sure to have had great accomplishments to list on your resume. Be sure to go into detail about what made you great then—and what will make you exceptional in the position you’re applying for now. 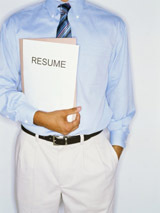 The goal of writing your resume is to make sure you get called for an interview. Unfortunately, this can be difficult to do if you get tossed into the denial pile because an employer is worried that you’ll become bored with your job and flee as soon as you can. By adjusting your resume accordingly to get the interview, you have given yourself the opportunity to sort out the remaining details face to face.